For my September customer cards I wanted to create so colourful rainbow cards so I got colouring with my Stampin’ Blends to create a background. I used seven of the dark Stampin’ Blends in Real Red, Pumpkin pie, Daffodil Delight, Granny Apple Green, Bermuda Bay, Night of Navy and Blackberry Bliss to colour stripes to create my background. To finish off the card I cut out the Thank You Thinlit in Shimmery white cardstock and added some punched out some stars from the Twinkle Builder punch to embellish. For my second card I switched things around and cut my “Thank You” and gthe stars from some coloured cardstock and stuck onto a white card base. The best adhesive I’ve found for using these large delicate die cuts is the multipurpose adhesive sheets as no adhesive is shown, but be careful when placing your die cut as when they’re stuck down there’s no moving them. I love how simple and bright these cards are, they could easily be turned into birthday cards using the Happy Birthday Thinlit die, you could also change up the colours to match any theme you like. 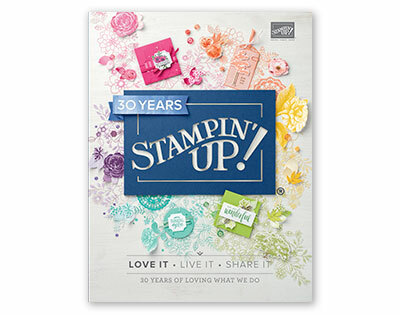 The beautiful paper doesn’t need much adding to it to make a great card so I just stamped a simple panel with the largest floral stamp from the Love What You Do stamp set in Rich Razzleberry. I added a little texture to the card with the new Rich Razzleberry Velvet Ribbon which is so soft to touch. Hope you’ve enjoyed today’s project. Painted Harvest was one of those sets that passed me by on my initial looks through the Autumn/Winter catalogue but once I started seeing projects made by other demonstrators and customers I realised it’s definitely one I needed to have a play with. I think I was put off by this set because I’m not a huge fan of yellow so sunflowers aren’t my favourite flower. After having a good play around with this set I can say that most combinations of colours work well, even the purples like on this card. To make this card I took a piece of Very Vanilla cardstock measuring 10cm x 14cm and sponged over it with Crumb Cake ink to give an aged look. 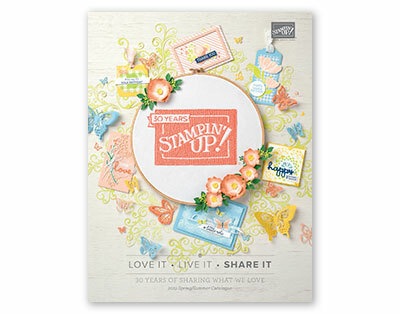 Next I took the first sunflower stamp, the one with less detail and stamped randomly over my card in Sweet Sugarplum. I then stamped over these with the more detailed sunflower in Fresh Fig. I’m not entirely sure its lined up properly but I love how these flowers look. For the centres and the dotted detail I used Soft Suede. I added a few random dots with old olive to fill in the gaps. The sentiment label was created from the blank label in Label Me Pretty. I used an Old Olive marker to ink just around the edge, so I didn’t have the extra swirls. I used Fresh Fig to stamp the greeting and the Pretty Label punch to cut out. I added three rows of the Fresh Fig Sheer Ribbon for somewhere to ground the greetings label. I also decorated the inside of the card with a couple more flowers. I really love how this card turned out, probably because its using my favourite colour Fresh Fig. I can’t wait to show you what else I’ve created with this set. Sorry for being missing for over a week, I was enjoying being in my garden last week while we had some sunshine so didn’t get much crafting done, I do have some lovely tomato’s ready though! For today’s card I pulled out the Paisleys & Posies stamp and die set as its been months since them have been used. After a few disasters I came up with this card. As you can see I went for a colour combination of Melon Mambo, Pool Party and Powder Pink. After initially being unsure about Powder Pink its a colour I’m starting to love and is becoming my favourite pale pink. I coloured the paisley circles using my markers which needed to be re-inked ( first time since I’ve had them five years ago), which took a bit of time but was quite relaxing, especially when the results turned out so well. I used the little flower stamp to create more of a background and added a sentiment from One Big Meaning which was stamped on an oval from the Layering Ovals Framelits. I finished the card off with a little Pool Party twine to bring out this colour on the card.